Elected officials come in three levels: federal, state, and local. You have a role in determining who gets elected to all three. 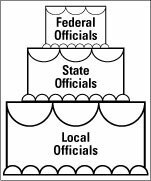 You can think of these officials as three tiers of a wedding cake: As you move down, each layer gets larger and larger, with more and more politicians. (See Figure 1.) The president and the vice president go on top of the cake of politicians. It’s up to you whether or not they hold hands, or whether you want to file for divorce at the next election. Figure 1: The levels of our political system are like the tiers of a wedding cake. The federal government consists of three branches: judicial, legislative, and executive. The judicial branch consists of federal trial and appeals judges, including the U.S. Supreme Court. These judges are nominated by the president and confirmed by the Senate — you don’t have a vote in the selection of federal judges. The judicial branch of government interprets federal laws when lawsuits are filed in federal courts. On occasion, it also decides whether state laws conform to the federal constitution. You do elect the members of the legislative branch, called Congress. (Congress includes both the U.S. Senate and the House of Representatives.) Congress makes the laws by passing bills. You also elect the heads of the executive branch: the president and the vice president. The executive branch of government plays a role in making laws by the use of the president’s veto of legislation. The executive branch also carries out the laws that Congress enacts and the courts have clarified. How we elect federal officials — the president, the vice president, senators, and representatives — is set by the U.S. Constitution, which has been changed several times to encourage more participation by voters. The U.S. elects a president and vice president every four years. They are elected together to avoid having the president from one party and the vice president from another serve together. This happened early in our country’s history without damaging the republic, but it created enough fuss to suggest that it was not a good idea. You don’t elect the president and vice president directly, but you do have a role to play in their election. Each state, regardless of its population, elects two senators to serve six-year terms. Every two years, one-third of the Senate is elected, so your state may or may not have a Senate contest in a given general election year, which is a year in which candidates are elected in most constituencies. General elections are held in even-numbered years (1994, 1996, 1998, and so forth). Each state also elects Members of Congress, called representatives, who serve in the House of Representatives in the Congress. The number of representatives in Congress is limited to 435. The census, taken every ten years, determines how many of those 435 representatives each state has. States with growing populations gain congressional seats after the census, and states with shrinking populations lose congressional seats. After the census results are in, each state’s legislature redraws the congressional districts for its state. The exact boundaries of these districts are the subject of much political fighting, turf warfare, and teeth gnashing, as incumbents try to sweet-talk their state legislatures into drawing districts that would allow them and their next of kin to maintain their current lifestyle. A Member of Congress is elected every two years and represents roughly a half-million people in his or her district. Each state is divided into three branches of state government, just like the federal government: judicial, legislative, and executive. The functions of these three branches are largely the same as they are with the three branches of the federal government. Judicial: Judges in state courts interpret state laws. Some states elect their trial court and appellate court judges; some don’t. Some states permit citizens to vote to retain or remove judges but don’t permit partisan elections for judicial positions. Whether you can play a role in the selection of judges depends on your state law. Legislative: State legislatures enact laws that apply to their state. In each state, voters are grouped into legislative districts for the state legislature or general assembly. You are assigned to a district for the upper and lower houses of your legislature. The upper house is usually called the Senate, and the lower one, the House of Representatives. You choose an official for each house of the state legislature. The terms vary from two to four years. The ever-efficient and tidy state of Nebraska has only one house in its legislature consisting of 49 members with no party affiliations. Executive: The voters of each state elect a governor for their state. When the election takes place and how long the governor’s term is depend on state law. Most states have four-year terms for their governors and elect them in general election years. Vermont and New Hampshire have two-year terms. A few states, like New Jersey, elect their governors in odd-numbered years. Most states elect a governor and a lieutenant governor on the same ticket, and many states limit the number of terms a governor can serve to two or even one. Cities, towns, and counties also have elections to choose officials for their legislative and executive branches. Some judicial offices may be elected at the local level, but these courts handle small-claims issues or local ordinances for minor matters. State law largely governs criminal and civil matters. Mayors, city council members, county commissioners, and the like are elected at the local level. How, when, and for how long these officials are chosen depends on state law. Some states elect local officials in odd-numbered years, some in even-numbered years. Some officials have term limits; some don’t. Your state or county election board or clerk’s office can tell you how these elections work in your community.